Heh. Ill say this again. NO PAINT that is not mixed as a two part, meaning the base is the actual paint, and a catalytic "activator" is added the time that you mix/apply the paint... NO PAINT that is not chemically hardened is anything resembling durable.. Im sure the testors paint has excellent properties for adhesion to plastics. Unfortunately, that has nothing to do with the paints resistance to wear, or resistance to chemicals.. Models are not designed to be handled frequently and extensively. Even the stuff that they have NOWADAYZE that is advertised and sold for use on car interior plastic pieces and comes out of a spray can doesnt last. Its great if you plan to sell the vehicle soon.. Otherwise, take it to a trim shop where they can use a professional (once again, chemically activated) product. Edited by MEtalGuy66, Wed Sep 26, 2007 7:48 PM. NO PAINT that is not mixed as a two part, meaning the base is the actual paint, and a catalytic "activator" is added the time that you mix/apply the paint... NO PAINT that is not chemically hardened is anything resembling durable. I'll double that. I have to handle my spray can painted 1250XLD and 1001 like raw eggs, so the don't get scratched. The 1001 is always wrapped in a towel when going to shows, the 1250XLD has a false leather cover and a big cardbox with a styrofoam mold. I think my laptop will go to a car paint company or something alike for its final paintjob. BUMP TO AN OLD THREAD!! 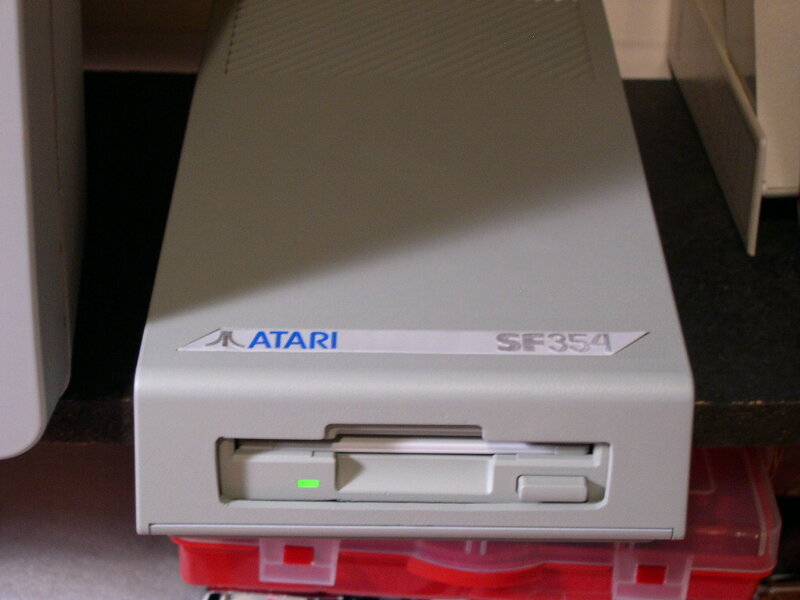 I was really wondering about this and glad you pointed to it from the XF551 thread, as I have recently had bad luck with the un-yellowing of an extremely yellowed SF314. So I am going to look for a hobby store that carries yours and Wgungfu's paint. I was thinking of posting a question about this. Belated thanks for the info. Question about the drive mech: What kind is it? Where did you get it? Did you have to solder in a new (longer) cable to flip it? How did you get it to mount "behind" (slightly) the position of the original mech? 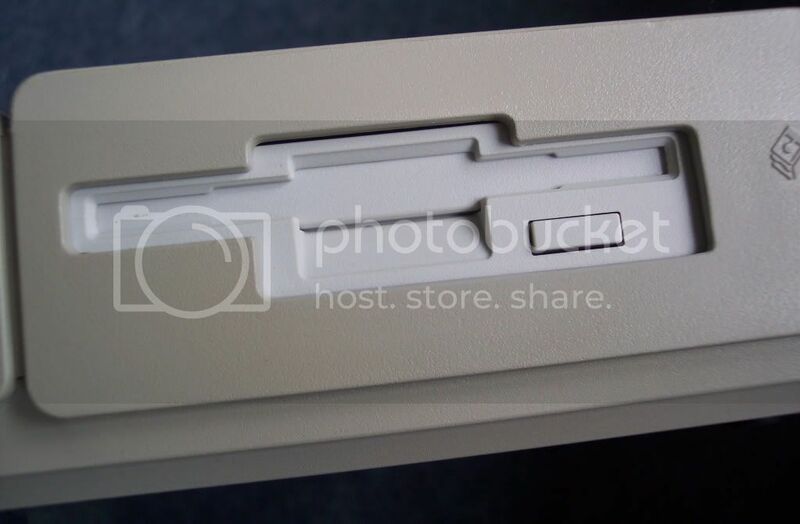 I mean, if the faceplate of the original mech is embedded in the front wall of the drive case, and the new mech (with faceplate attached) is "behind the wall" then did you have to drill new holes in the bottom of the case for the screws to line up? .....from "atarifreakz" in the U.K. It's a Chinon FZ-357 1.44MB drive. 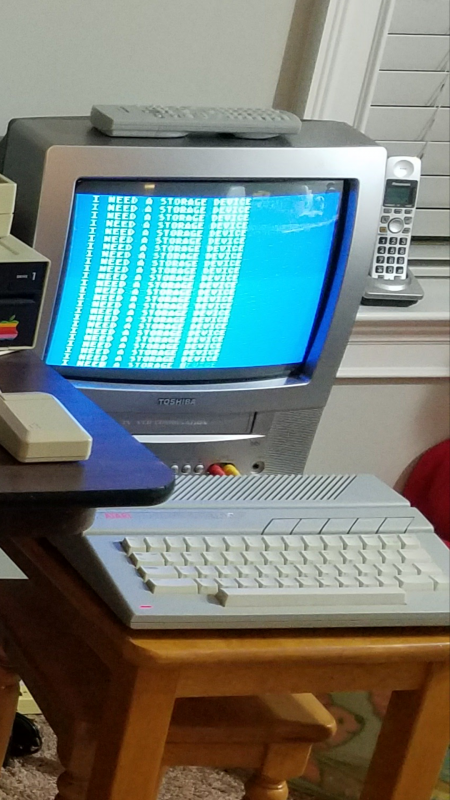 I chose it because I did not have to use a longer floppy cable or power cable. It fit perfectly. Other mechs had to have the cable "flipped" and extended. I did nothing, it just lined up by itself! I may have used some spacers to set the drive level but that's it! Edited by tjlazer, Sat Apr 17, 2010 9:42 PM. They probably did. My Dad and I used to rehabilitate faded car dashboards with paints specifically designed for automotive plastics. The first time we did this was 91 or so and I didn't have the impression it was spiffy new tech then. This stuff was a bit different from the Testor's model paints. You clean the interior parts first then spray a fast drying pre-treatment which just provided a good surface for the paint that was designed for it. I drove one of those cars for a few years and didn't have any problems with the paint fading or coming off. Now THAT is cool! That is a One of A Kind piece of Amiga User History, right there! Badassed! I tried some on the monitor/TV I use with my XE and I do think it's a good match. Looks good! Does it match well in person? Yes, matches as well in person as in the picture. Just to preventief any wrong informatief: No Atari computer case ever was painted in the factors. All have their color mixed into the plastic. This false conclusion of ST cases being painted is caused by the fact that the inside of some ST computers had a red painted coating on the inside. This is conductrice paint used as a cheap and dirty alternatieve for the metal shield. I've tried painting a SM125 monitor but the dolor I used turned out to be not a perfect match....although it did improve the looks of it greatly. This was a case beyond Retrobrighting. I would always try Retrobrighting first. I've had excellent results with both XL and Xe and ST. Only this SM125 came out totally blotched,.....but then again it had the worst case of yellowing.....actually more browning I've ever seen. I feel paint takes away a bit of the structure of the plastic. Definitely do not sand I feel not absolutely necessary as this will take away even more of the structure. Painting another device like a TV or monitor is of course a great idea....looks really nice!!! 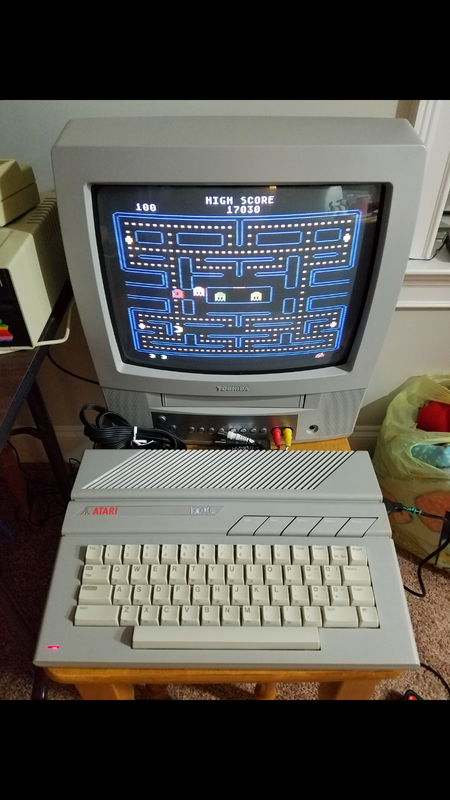 I always felt it a big shame that Atari never released matching monitors to its 8 bit computer lines and this is a great idea to compensate. Sadly the listed paints here are usually US only....although I do know that rustoleum painters touch is available here as well, but the cans look different and the color names or codes might differ too. We use the RAL color system mostly here.in Europe,...anyone has a RAL code that really matched the XE/ST color ? Edited by Level42, Mon Jun 11, 2018 11:38 PM. Sometimes painting is the last resort. Back when I was learning how to retro-brite I got several ST cases with terrible case of 'blooming'. The only thing left to do was to paint them back to ST gray. I used both Testors colors above, and their IMOP was a perfect match. though a huge improvement to a bloomed case. knowing that this a model paint is not meant for handling, a few coats a good quality lacquer will solve that trouble. In fact, after a good retro-brite, a couple lacquer costs should keep the case from yellowing again in our remaining life times. Doesn't lacquer make the result shiny ? I actually found out that Rustoleum Painters touch is readily available, at least over here in The Netherlands so probably in the rest of Europe too. Anyway.....gonna look to find one of those. Edited by Level42, Thu Jun 14, 2018 3:37 PM.